Where were you last Monday? You know, Memorial Day? Some of you were kind enough to pull out your cameras and share the view. Canon T2i, 10mm, f/8, ISO 100. This is a picture of the Golden Gate National Cemetery, located in the city of San Bruno, 12 miles South of San Francisco. 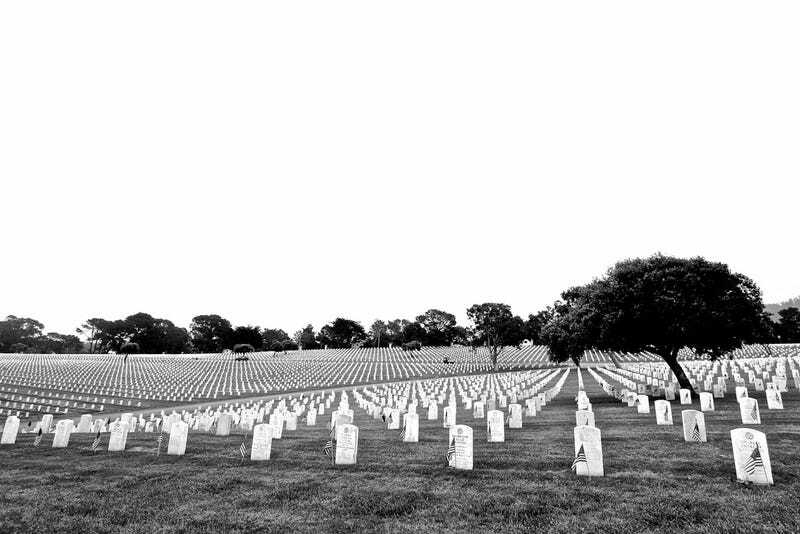 The cemetery was officially dedicated on Memorial Day, May 30, 1942. My wife really wanted to go to a memorial day event that was going on near her work. After looking at this weeks contest i decided that this would be the perfect place to take a shot. This shot was taken in Ohio at an event for Memorial Day with a Nikon D5100, ISO-100 f/5 with 18-55mm lens and very few enhancements with photoshop. It is titled "Field of Heroes" after the event. Too Far, Fanboys. Too Far. The shot was taken with a Canon EOS 7D equipped with the 24-105mm f/4L Lens. ISO 100, 32mm, f/4, 1/1600s. I recently left my job and found something creative to do with the uniform to make the picture Memorial Day themed. All editing was done in Aperture. Happy Memorial Day! Memorial day weekend doubled as a goodbye party for Justine. After serving several years in the Guard, she was going to leave for the Marines Tuesday. I've shot her breathing fire several times and wanted to try something different this last time. So she let loose one last time in front of a crowd of friends and family as I laid down in front of her. Used a Nikon D800 at 2000th of a second at F10. For this weeks challenge I captured the American Flag. I used a Lilac bush in the foreground to frame my shot. I used with my Canon T1i at f/4.2, 1/640 sec with a focal length of 75mm. All of the editing was done in Light Room which consisted of a little color tweaking. SONY DSC-WX150 Focal Length - 4.45mm Exposure Time- 0.008s (1.125) f/8 ISO 100 The fact that the Kentucky Vietnam Memorial is minutes from my home made for a convenient, albeit reflective shoot. I try to make it there twice a year to pay my respects and hope have the honor of speaking with some veterans, and hearing their stories. This time I spoke with a couple of Korean War veterans- mainly in regards to how no one comes to pay their respects anymore. That we've basically forgotten them. I was shocked when I was thanked by THEM for coming to the memorial. The memorial is actually a giant sundial, and the tip of the shadow casts upon each veteran at the anniversary of their death. I took this an hour or two before sunset, freehand, with my Sony point and shoot. I don't have the knowledge or equipment to take truly breathtaking shots, but I like to think I have an eye for capturing those great moments when real photographers left their camera at home. Camera: Canon Rebel XS Lens: 17-85mm ISO: 400 F-stop: f/5.6 I was with my some friends Sunday afternoon riding on Foothills Parkway in east Tennessee, and we came across this gentleman. He was alone next to a motorcycle gang. I asked my friend to stop so I could take his picture. He reluctantly agreed to let me take his picture. He already set the scene with his handle bar stache, big truck, no shirt, and the American flag behind him. Thanks to everyone for taking the time to enter this week's challenge—on a holiday, no less! I was particularly taken by our winner because, even though we've all seen shots framed like this before, the white blowout in the sky actually blends into a white backdrop perfectly, invoking the feel of infinity. And if you'd like any of these photos in high resolution, head to flickr.